EZeeBUY packs world-first features to let younger consumers digitally “ask” their parents for permission to buy something or simply place desired items on a family-shared “wish list.” Accessible by family and close friends, the social media-integrated wish list, removes the stress of gift selection while allowing parents to encourage better money management in their kids. Users can also make charitable donations with ease. EZeeBUY will make shopping with cryptocurrency as everyday as cash or credit cards. The EZeeBUY wallet supports a variety of currencies, cryptocurrencies—including EZeeBUY’s own EZ8 token—and peer-to-peer (P2P) payment methods. 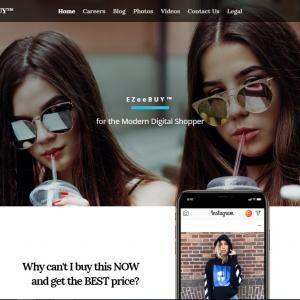 Through its AI and deep-learning technologies, the EZeeBUY app builds a detailed profile of a consumer’s interests, purchasing habits and favorite brands through their mobile device’s photo library, allowing brands and retailers to provide highly customized offers and limitedtime discounts. Embracing cutting-edge technology, EZeeBUY uses augmented reality to enhance their mobile shopping experience. Browsing products in 3-D goes far beyond the staple slideshow of static images and ushers in the era of interactive shopping.